Muirwood: The Lost Abbey is a story I enjoyed reading. The fantasy genre has enjoyed a growing popularity in recent years, giving the world some spectacular stories. Its rise has also given birth to dull, unimaginative tales by those who think all they need to do is create a big world, slap some made-up names on imaginary towns, a little sprinkling of magic, and they are good to go. Thankfully, Muirwood: The Lost Abbey is neither dull nor unimaginative. Muirwood: The Lost Abbey is about a kingdom where women are forbidden to study because some time in the ancient past, women with that privilege learnt some dangerous magic and tried to destroy the world. This is also one of the reasons the King of Muirwood imprisoned her daughter who learnt to read at a young age and is connected to magic. After many years of peace and lack of magic, an unexplainable darkness appears in Muirwood - citizens are killing one another with no reason. It is like reason and compassion have fled from their minds. The king then summons his imprisoned daughter to embark on a quest to seek out the knowledge to destroy the curse that plagues the country. She refuses at first, but later decides to obey. is a dark fantasy tale that lays a believable foundation for subsequent stories to come in the series. The art is one of the unique works I have seen this year. It looks smudgy when you look at it closely but wonderful when you take in the whole picture. That bothered me a little for some minutes. Needless to say, the art grew on me and I came to appreciate the use of colours and the depth of shadows that gave the book a brooding feel. The dialogue is smooth and natural. The only gripe I have with the book is that the transition from narration to monologue was at times disjointed, which can confuse the reader a little. 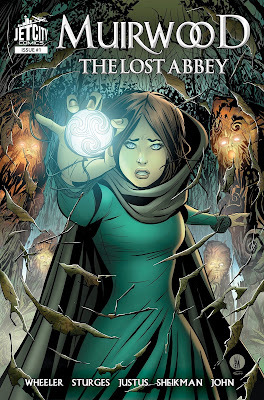 Other than that, Muirwood: The Lost Abbey is a story I enjoyed reading. You should get a copy, if you can. Many thanks to Jet City Comics for review copy. All images are © to their respective owners.